Rick Burrows, answering to the broadcast moniker DJ Rickdiculous, runs KDNK's Flow Diggity on Tuesdays at noon. 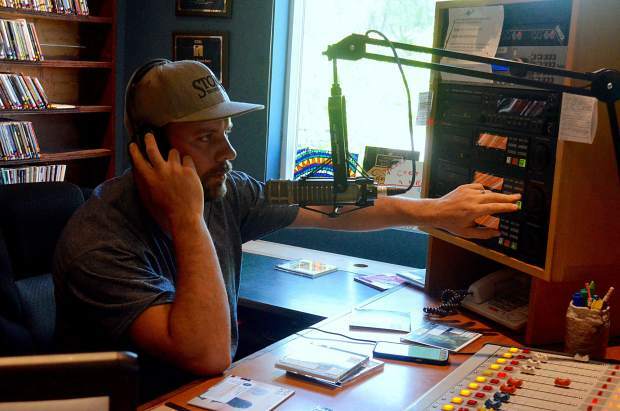 Carbondale trustees have approved rezoning the home of KDNK from residential to “historic commercial core,” allowing the community radio station more flexibility in using its space and hopefully leading to additional revenue. The station’s property has been used commercially since the 1980s, despite the residential designation, said Janet Buck, Carbondale senior planner. So, even though the station has approached the town on numerous occasions, KDNK has been prohibited from having temporary special events, she said. Gavin Dahl, KDNK’s station manager, on Tuesday talked with the Post Independent about a variety of uses that he envisions for the station and how they can help bring in money. The rezoning is part of a plan to boost revenue, both through individual events and by making membership in KDNK more enticing, after the station board last year became concerned about finances. The station’s revenue primarily comes from underwriting, membership and grants. The rezoning will allow the station to use its broadcast learning center, which can hold about 45 people, for events or programs. Dahl and his staff hope to draw band rehearsals, teachers looking for space, community forums or other political engagement events, documentary screenings, band jams, songwriting workshops, local music showcases and more. The staff plans some members-only events as well. Dahl said that in the long term, he hopes to use this space in a way that will add value to being a member and to give the community a good, available space. The station can act more as a convener for the community and its own membership, building more of a culture where members come together, he said. Outside of membership meetings, there hasn’t been a consistent thread of events for members and volunteers to participate in at the station. The station boasts about 100 volunteers and 1,000 members. “KDNK will always be radio-first, but what it means to be a public broadcasting outlet is evolving, and we want to keep it interesting,” said Dahl. For now, KDNK plans to experiment with some different types of events, to see what could work in the space. KDNK’s station will also start having events during Carbondale’s First Friday celebrations, the first of which will be an open house July 7. Both the town’s Board of Trustees and the planning commission came to unusually quick decisions and showed a great deal of support for the station, said Dahl. “It was very clear that they value the station as an essential part of the community,” and to have the support of Carbondale’s elected leaders meant a lot to Dahl as the new station manager. “It was a huge blast of wind in our sails,” he said. This effort comes while public broadcasting stations are under serious threat in the Trump administration’s federal budget proposals. KDNK gets about 20 to 30 percent of its budget from a Corporation for Public Broadcasting grant, which the president’s budget calls for zeroing out. While Dahl hopes that bringing in additional revenue through the rezoning will help build the station’s budget, it may instead have to serve as a crucial backstop to replace lost CPB funding. Dahl said he thinks many Republicans still support public broadcasting, and the station hopes Rep. Scott Tipton will continue to support the CPB. Meanwhile KDNK has also announced a new full-time news director, Raleigh Burleigh, a Carbondale native who attended the University of Colorado Boulder, studying international affairs and journalism. Burleigh also worked as the station’s news intern.